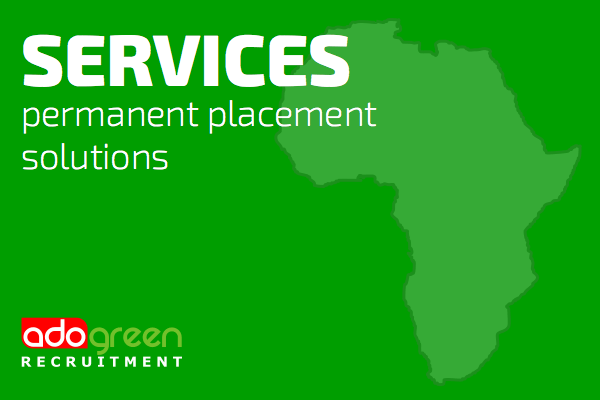 AdoGreen Africa Recruitment has been established since 2007 and provides Recruitment | HR | RPO consultancy services in the African region. Owing to the success of tried and tested recruitment methodology within well-established business hubs to unfamiliar and remote locations, AdoGreen has been able to deliver above expectation on recruitment specs across a spectrum of diverse environments. This has positioned us with the confidence to embrace any recruitment need and challenge within Africa. Although there is a primary focus on the Heavy Industry in Africa, we are technically and intelligently equipped with the experience to tackle the most challenging of assignments. When looking for permanent employees, we like to understand your company culture, the dynamics and you expectations to align the best talent for your needs and the future of the company. AdoGreen will shortlist from the best of the best identified to offer you a small, but highly targeted list of potentially suitable candidates. Our methodologies and characterised by quality candidates both in experience and character in order for us to best position your company to gain a high staff retention rate when using our services. Our goal is to become a valued long term business partner and not just another service provider. We work on a refund and replacement guaranteed over a 3 month period on a sliding scale subject to our terms and conditions.